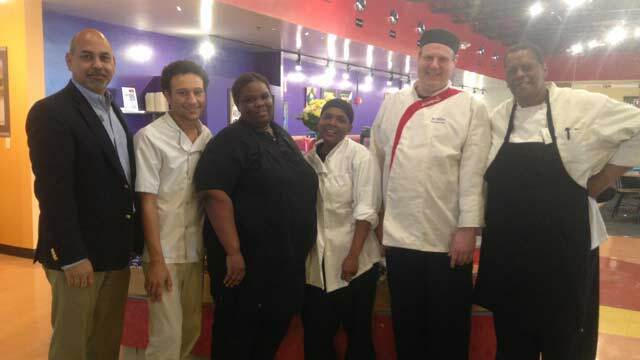 Sodexo campus dining teammembers Octavio Pino, Marvell Holmes, Sharneka Jackson, LaTanya Harris, A.J. and Janice Boyd worked to serve meals to over 100 student residents despite Sunday's power outage. An unexpected Ameren UE power outage affected Webster University’s home campus on Sunday, Feb. 21, lasting from 4:30 a.m. to approximately 7 p.m. To minimize the impact on student residents, campus dining staff made extra efforts to ensure student residents had meals despite the power outage. Sodexo general manager Octavio Pino, executive chef A.J. Miller and their team came in to make sure that students had food available to them. They served students on the Marletto’s Marketplace patio—feeding approximately 100 students—despite having no power in the kitchen to prepare hot food. Students who were fed during the outage were understanding and appreciative of the dining staff’s efforts. “This level of caring really means a lot to our student residents,” Hoef said.